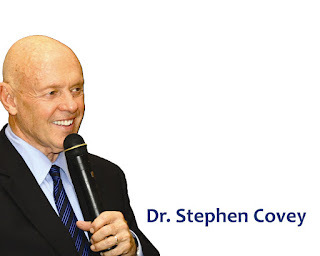 I attended the Knowledge Forum of Dr. Stephen Covey recently in Hyderabad. It was a one day gathering of 500 people so Dr. Covey presented with four large screens in a big hall. There were 7 good things he did which other presenters should learn from. 1. Repeat the important stuff. Dr. Covey did repeat important phrases/statements throughout the speech and kept connecting it back to the core message. This is a good practice for long presentations. 2. Keep inviting questions throughout the presentation. He did not have a question and answer session at the end. It is better to clarify doubts and answer questions on an ongoing basis. 3. Use videos. Since it was a day long presentation using videos keeps the audience attentive and interested. Videos that are relevant, which help explain every important point you make. Before any video was played he also used to mention what was the objective of the video so that the audience knows what to watch out for. 4. Effective use of humor. His speech and videos were well garnished with humor. Whenever the topic became too serious Dr. Covey used to infuse humor and win over the audience. 5. Giving handouts before the start. While explaining important concepts, he would direct the audience to open the handout and see the diagram rather than looking at the PowerPoint slides. Whenever your audience has come to learn from your presentation (and also to make notes) giving handouts in advance makes their life easier. 6. Enhance audience understanding. While explaining a concept, Dr. Covey would refer to some character from an earlier video so that people can relate better. He also made the audience write a few times in their notebooks. This I feel enhances retention and understanding. 7. Use Props. This was something I liked the most in Dr. Covey's presentation. He was asking us to 'find our voice' (find out what we really like to do in life) and then 'inspire others to find their voice'. To explain this he lighted up a matchstick (find our voice) and then used this matchstick to light up another matchstick (inspire others to find their voice). It was dramatic but it worked! You could see it in the audience. Which of these habits are you already following? Which are the ones you would like to try out in your next presentation? Leave a comment.